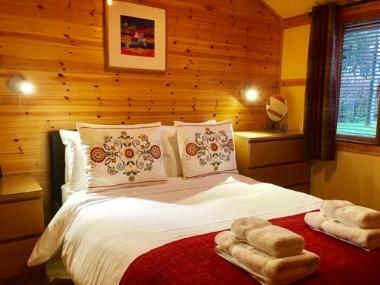 Everything is included when you holiday at Rashfield Sheilings, two charming luxury cabins overlooking the River Eachaig, by the Argyll Forest. All you need bring are toiletries, food and refreshments. With wood burners and full electric heating they are very cosy and warm in Winter, yet cool in Summer when viewing the water from the deck. Each is fully equipped with everything you needed for a short break or longer holiday to the Scottish Highlands. There are lovely woodland walks, Botanic Gardens, and waterfalls nearby, and the nearest town is only 10 mins drive. A perfect location for romance. In the evening, after a hearty home-cooked meal, or visit to a local restaurant, sit out on the deck under the inky blue sky and view the stars. When the weather chills, warm in front of the wood burner. Perhaps, in the morning observe the bird and wildlife on the river, as you hide from view in your cabin. Satellite TV, DVD player and iPod docking station provided, and FREE Wi-Fi. Situated 10 mins drive from the main town of Dunoon, Rashfield is a small hamlet with a farm, a few houses, and a couple of lodges. Rashfield Sheilings are a beautiful place to stay, and they capture the sun from morning until night. Viewed to the east is the Argyll Forest Park, and to the west the open Eachaig Valley with hills just beyond. A short walk brings you to the famous Pucks Glen and a little farther to the Benmore Botanical Gardens and Loch Eck. A 5 mins drive takes you to the Cothouse Inn and Services, Sheila's Diner and the shores of the Holy Loch and the Nature Reserve. Think of this self catering accommodation as a special retreat from the daily grind, perhaps a touch of luxury and taste of country living... The cabins are situated beside the salmon River Eachaig and close to the famous Pucks Glen forest walk. Its a magical location which changes with the seasons. Visit the tall trees of the Benmore Botanical Gardens, walk the mediaeval path to find the site of iron age dwellers and historic Christian chapel. Scan the waters of Loch Eck for signs of the ancient crannogs, visible when the water is low. If you like bird life and wildlife theres an abundance in these parts. Red and Roe Deer, Red Squirrel, Heron, Curlew and Oystercatcher are frequently spotted nearby, whilst it is known the area is also home to the lesser spotted Otter, Pine Marten and Golden Eagle. The natural beauty and romantic setting is to die for. Visit the Gallery for some images.